"Each individual is expected, for the rest of the night, to conform in speech and manners to the character which Fortune has assigned him. If persons address each other by any but their newly-assumed title, it may be made the subject of a forfeit. Miss Revel having conducted the sports of some extensive Christmas parties upon a novel principle, her mode is here submitted to consideration. Let the person who gives the entertainment make timely arrangements for drawing the characters. Two lists should be made, containing the names of the visitors expected, one for the males, the other for the females; prepare a corresponding number of tickets, containing characters, to which are affixed' some doggrel rhymes or Hudibrastic lines appropriate to the subject: the slips of paper on which these are written must be numbered on the back, and all folded of one form. The ladies' characters, must be put in a reticule or bag; arid those for the gentlemen into a hat. 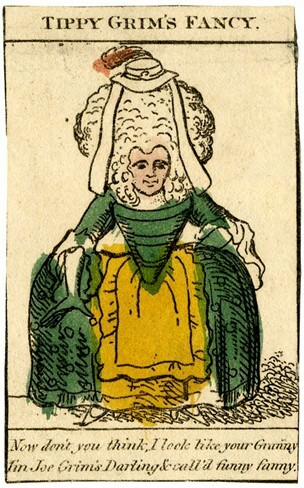 When the tea is concluded, a lady carries the hat for the men to draw, and a gentleman carries round the reticule for the females; the two tickets which remain after the general distribution, are to be appropriated by those who banded round the bag and the hat. The conductor of the games next arranges the drawers precisely in the numerical order of their tickets, either in two opposite lines, or in a great circle; this being done, the King, who is always No. 1, commences to read his lines: No.2, Queen, replies by reciting those on her ticket; then follow the rest. Of course, it is essentially necessary to range the players in the order of their numbers, because they are contrived to elicit a reply, or contain pertinent allusions. Must consent, for this night, to submit to my rules. But for me, I'm resolved, if I can't lead I'll drive you. If some rich maid will purchase a Knight of the garter. If you'll marry a beggar's heiress, she'll promise to make you rich. Cook and the later whole sheet is from the London Illustrated News Jan. 8, 1881. The second two sketches are from The Book of Christmas ...by Thomas Kibble Hervey… Illustrations by R. Seymour. London: 1836. 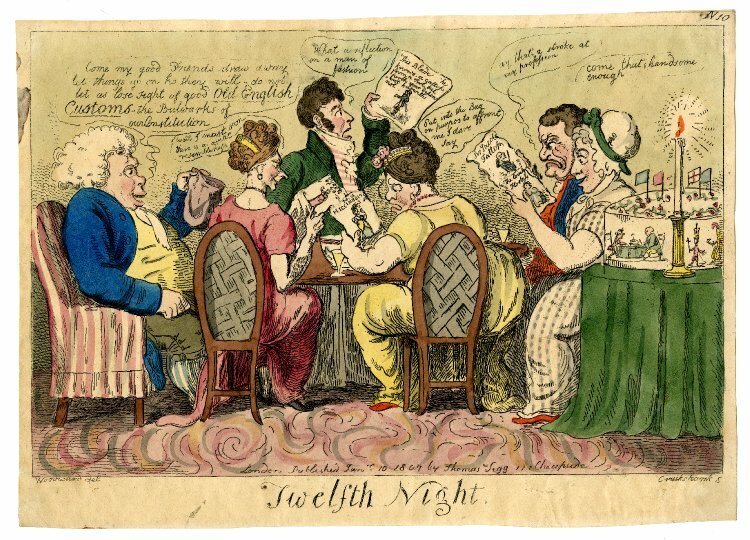 Two colored 'Twelfth Night' by Isaac Cruikshank, 1807 from the British Museum online collection, as is George Cruikshank's Tippy Grim.